ONTARIO, Calif. — Credit unions and captives continued to take advantage of the pullback by banks in the second quarter. The message coming out of CU Direct (CUDL)’s Sept. 28 webcast is that credit unions need to act fast before banks reconfigure their strategy. 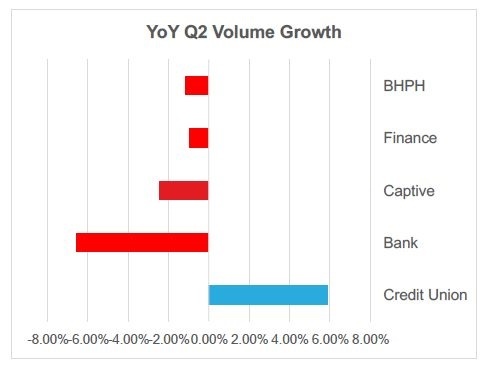 Banks continued to hold the largest share at 32.3% in the second quarter, although the segment’s hold on the market fell 2.5 percentage points. Captives picked up some of that, increasing their share by 1.6 percentage points to 28.6%. Credit unions were the biggest benefactors of the pullback by banks, increasing their hold on the auto finance market by 1.6 percentage points from a year ago to 20.3%. CUDL executive Michael Cochrum said the subprime pullback was only partially to blame for the bank retreat, noting that competition also played a role in the segment’s pullback. "They feel like competition is too strong, and it's difficult to maximize your profitability in a market that's highly competitive," Cochrum said, adding that the real competition lies in the used-vehicle space. On a quarter-over-quarter basis, captives continued to pick up share in the second quarter, while credit unions led the way in terms of auto lending growth. Despite the pickup in originations, credit unions saw their share fall two percentage points from the previous quarter to 24%. Banks, however, saw their hold on the market fall 5% from the first quarter, while captives took back some share from the previous quarter. In the new-vehicle space, captives continued to dominate with a share of 53.2%, up from 52.2% in the year-ago quarter. Banks saw their share of new financing fall from 31.7% in the year-ago period to 28.8%, while credit unions increased their share slightly from 11.4% to 12.7%. In the used space, banks held the largest share at 35.2%, which was down from 37.3% in the year-ago period. Closing the gap were credit unions, which increased their share 1.6 percentage points from a year ago to to 26.7%. Captives captured 8.1% of that market, down from 7.4% in the year-ago quarter. Cochrum said the used-vehicle market represents a key opportunity for credit unions to grow their share. The key for that lending segment is strategizing with dealers to create more reasonable loan terms, especially since leasing seems to have plateaued after five years of growth at about 30.8%. Cochrum attributed the flattening of leasing to residual values, with the glut of off-lease vehicles causing collateral values to fall. He said captives are likely to respond by shifting from leasing to buying programs, which he believes could present credit unions with an opportunity to offer leases on late-model used vehicles to buyers looking for affordability. In the second quarter, used-vehicle leasing accounted for 3.61% of the lease market, down from 3.71% in the year-ago quarter. Focusing on the high-risk tiers represents another option for credit unions to grow share. The segment, however, has mostly focused on high-quality buyers — the reason for the segment’s higher average credit score than all other lending segments. To move downstream on the credit spectrum, however, will require a better understanding of the risk associated with lower credit scores, Cochrum said. Credit unions have also been known to underprice loans involving borrowers with credit scores below 700, the executive noting that the segment will need to rethink pricing strategies in order to maximize returns in the high-risk tiers. "Even above a 700 credit score, credit unions are priced 50 to 80 basis points under their competitors," he said.